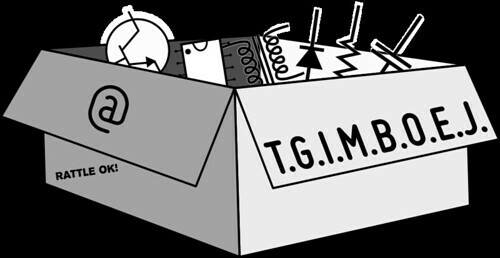 One of the big projects that we launched in 2008 is The Great Internet Migratory Box Of Electronics Junk, a pay-it-forward style hardware sharing program for electronics. Since our original article, TGIMBOEJ (pronounced Tig-Ihm-Boh-Edge) has somewhat taken on a life of its own. In that article, we set up simple guidelines for how to pass the box along, and in the interim we have taken a “laissez-faire” approach, watching and learning from the successes and troubles with that model. Our mostly-hands-off approach to supervising TGIMBOEJ has worked remarkably well in some respects. There are upwards of 40 circulating boxes now, which have passed through hundreds of hands. And, hundreds of other people have signed up on our wiki site tgimboej.org as potential recipients. 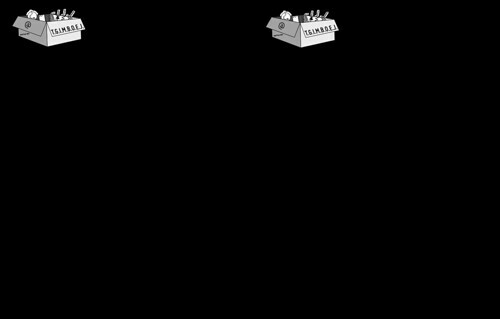 On the down side, the mean free path of many of the boxes has been far too short– some have made it just one hop before stopping. So now, it’s time to get serious. First, we’ve been contacting the last known recipients of the stalled boxes, and trying to get more of the existing boxes back into circulation. Second, we’re relaunching the tgimboej.org wiki site with a wholly new set of participation instructions and procedures. To keep boxes in circulation longer, we’re now encouraging that boxes should be sent to people who have specifically requested to participate— i.e., people who are familiar with how the project works. We’ve also introduced language in the revised instructions that will guide participants to keep an eye on their box, even after it leaves their hands. To further alleviate the potential problem of people ending up with boxes but not knowing what to do with them, we’re standardizing the printed materials that go into each new box. Gone are the cute but scrawled little notebooks, replaced by two neat PDF forms– one to log the progress of the box, and the other with detailed instructions on how to participate. Finally, we’re launching eight new TGIMBOEJ boxes this week, which — along with the others that are coming back into circulation — will help to increase the number and rate of box exchanges. So now it’s your turn. If you would enjoy trading electronics with like-minded individuals, this is becoming a great time to participate in The Great Internet Migratory Box Of Electronics Junk. To get started, please read about how it works on the TGIMBOEJ wiki, and if you’re game, add your name to the list of Box Requests. This entry was posted in Electronics, EMSL Projects and tagged electronics, tgimboej. Bookmark the Permalink. Is there a "Shiny Things Anonymous"? I started my own box a while ago. I’m not sure how far it’s gotten because the recipients haven’t seemed to be updating the "tracker", but you can request it on my site, VoidingWarranties.com if you want to box to be sent to you. THis would have been helpful before. I might make a new box with these standardized printouts in them. Look at geocaching post on forum! !